As Valentine’s Day quickly approaches, not only do my thoughts turn to potential date night and gift ideas for my amazing husband of 11 years, but also to how I can make the holiday fun for my daughter. Being a former teacher and artistic stay-at-home mom, we do a LOT of crafts in our home. Not only does Miss N love doing them but I thoroughly enjoy spending time creating fun and beautiful things with her! With a quick Pinterest search for some inspiration and a stroll through our local Super Target, we came up with three (3) fun and frugal kid friendly crafts; celery rose stamp art, pom pom owls, and an upcycled owl/bird house. Below, I’ll give a brief tutorial for each craft along with a supply list. I hope you enjoy these activities as much as we did! Lay out supplies listed above. Be sure to cut the celery (keep the stalks for snacking later!) so that only the base is remaining. You will use the base for your stamp. Put about a quarter size amount of red (or any flower color of your choice) paint on the paper plate and spread until it is wide enough to coat the flat surface of the celery base. Pick up the celery base and press the flat cut side into the paint. Lift it up and check a couple of times to make sure the entire flat surface is coated. Gently press the flat cut end of the celery to the paper and gently lift straight up. This will create your rose stamp! Allow the stamped image to dry. Once dry, add some green paint to the plate (careful not to mix with the red) and paint some leaves, ivy, stems, etc. to go with your roses. If desired, cut the dry roses out and mount on a folded piece of paper to make a Valentine card to give to friends and family. Lay out supplies listed above. Select a base (feet) for the owl and a pom pom for the body. Using the Elmer’s glue on the base, firmly press the pom pom down and set aside to dry. While the base and body dry, select a head and eye mask. Leave the paper backing on the head for now. Gently peel the backing off the eye mask and press the mask onto the head. Select two eyes, apply glue to center of each side of the eye mask, and attach the eyes. Set aside to dry. Grab the dry base with pom pom attached. Select a pair of wings and beak, peel the paper backing off, and attach wings to side of the pom pom body with pointed side facing down. Place the beak slightly below the eye mask and press gently to adhere. Peel backing off of the head and press to the top and front of the body. Select a heart sticker, peel off the paper backing, and attach to chest area. With a permanent marker, draw a rectangle large enough for the owl(s) to fit through. Carefully cut out the door along the lines and discard the excess plastic. If you’re concerned about sharp edges you can add tape along the cut surfaces to smooth it out a bit. 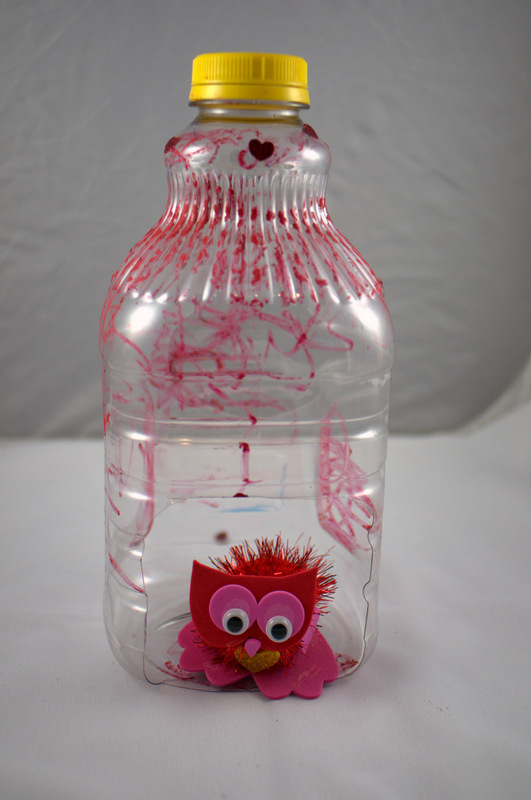 Have your child draw, color, or paint the surface of the bottle however he/she wants. Add heart stickers as desired. Place an owl or two into the bottle and have fun! Out of Business: Ford Hoosier Outdoor Experience | Outdoor Fun for the whole Family! See the Black Panther for Free in the Theater!